A fried corn tortilla topped with smoky chipotle and gravy mashed red beans, topped with refreshing radishes tossed in fresh lime. Drain the beans and add to the prepared Knorr® Brown Gravy. Add the lime juice, chipotle powder and cumin. Stir and mash until the beans form a chunky puree and are heated through. Set aside on low heat. Toss the Napa cabbage, radishes and pickled jalapenoswith lime juice and olive oil. Season to taste. 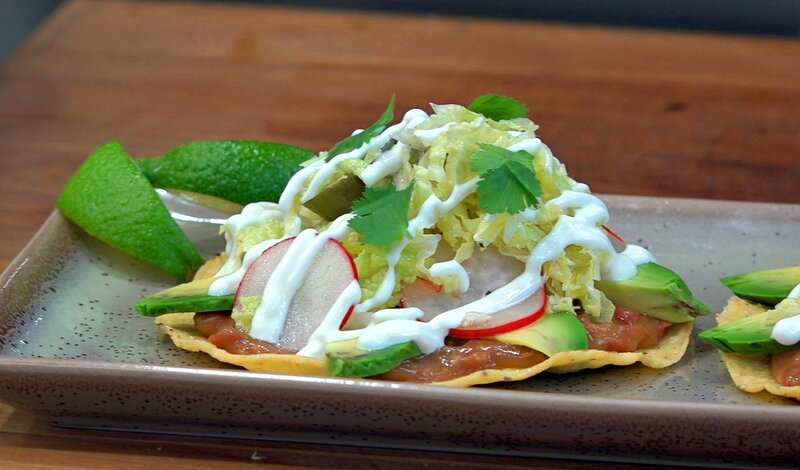 To assemble the tostadas, top each tortilla with ½ cup of the red bean mixture, then layer with avocado slices. Top with Napa cabbage slaw. Drizzle with crema. Top with cilantro leaves and serve with lime.